We gave ourselves an upper limit of £5 per work of art. I have to confess that I spent over that on this one. It cost me £6 but I couldn’t resist it. 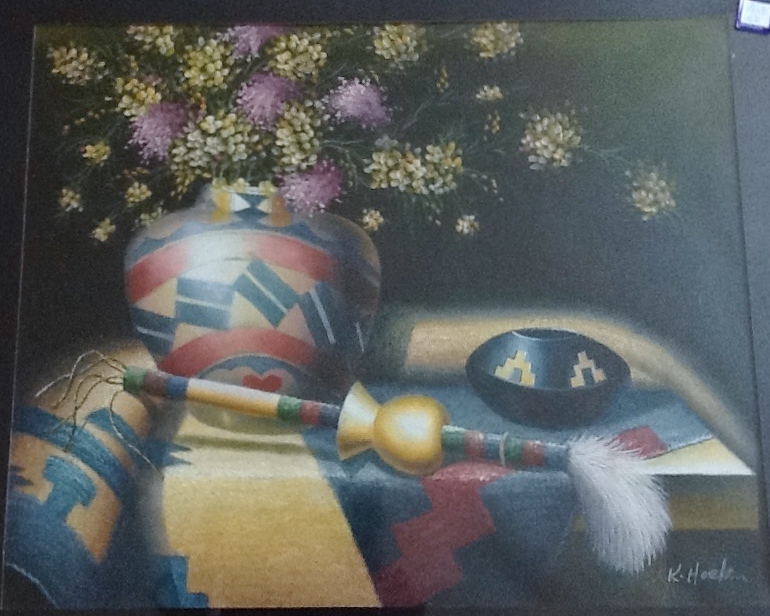 It is an original oil painting by K. Hoskin. It is large, 2ft x 2.5ft (or 62cm x 78cm). I would say it was very well painted although to my eye there is something not quite right about the large pot at the back. I did my best to find out who K. Hoskin is. He or she doesn’t have a website but there were some similar paintings for sale on a South African website so perhaps K. Hoskin is South African. The other paintings I found on line by this artist had a similar look about them and I would say the artefacts were very likely to be African. In any event, I would say it was definitely worth more than £6 and definitely deserved to be re-homed! I have one of his paintings. Came out of New York City. Don’t know how it got there. How much did you pay for this piece of Artwork by K. Hoskin? I have one and want to sell it. I only paid £6 in a charity shop.